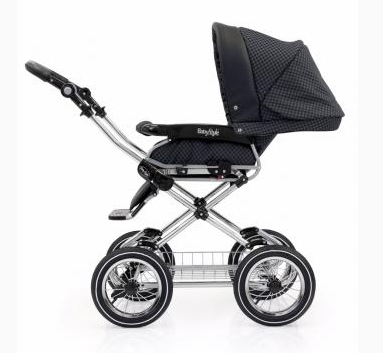 The Babystyle prestige is where tradition seamlessly meets modern elegance. 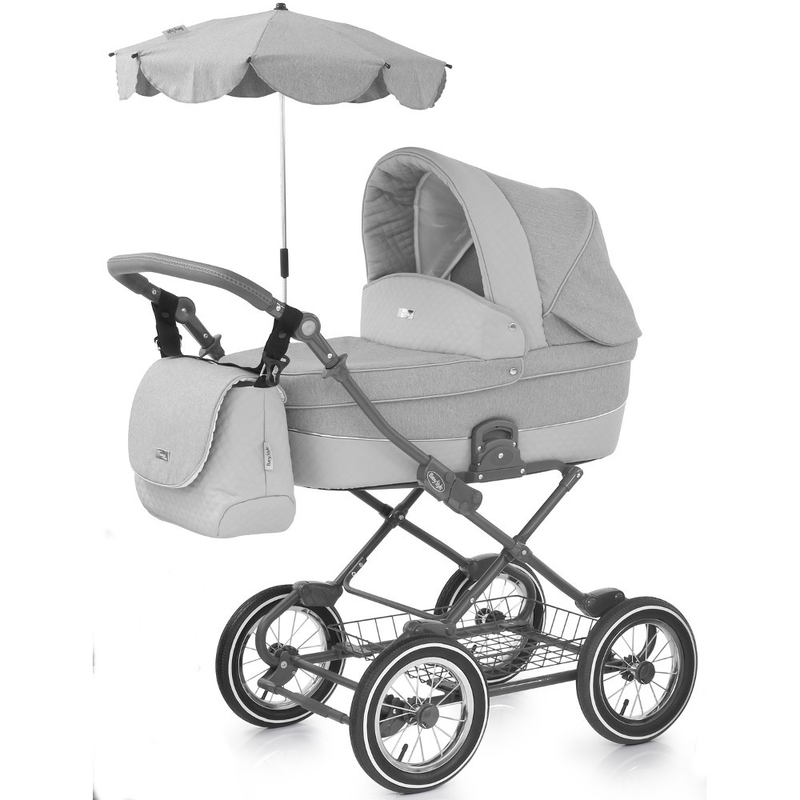 The Prestige comes with everything you need for your little one from birth to approximately 3 years old. 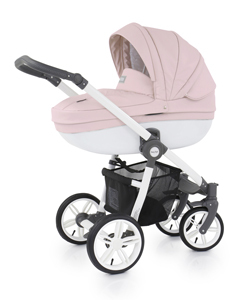 In the Babystyle Prestige your little one will travel in style - whatever the weather, whatever the adventure, from winter to summer the matching footmuff and parasol will keep them protected. With so many chassis and colour options you're sure to find one that suits you. Suitable from birth. 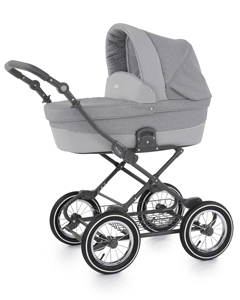 Available on a fully sprung Classic chassis in grey or chrome and a swivel wheel Active chassis in grey and white.Compatible with Prestige matching car seat, and Maxi-Cosi Pebble/Pebble Plus and CabrioFix car seats. 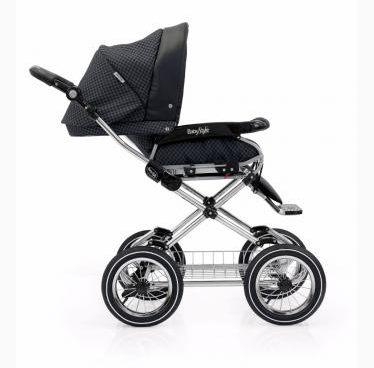 Height adjustable handle and adjustable pushchair footrest. Parasol. 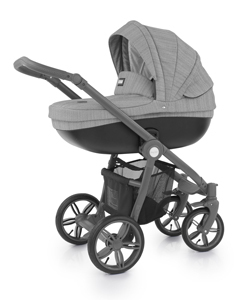 All models have a ventilated hood and ventilated pram body base. Removable and washable pram body liner.Suitable for occasional overnight sleeping.Rocking pram body with stabilising feet. Large shopping basket. Choice of wheel designs for the Classic chassis. Optional “zippy” rain cover for car seat and pram body. Adjustable multi position pram body sit up back rest. Multi position reclining seat unit, lie flat. Front and rear facing seat unit. Chrome white wall, chrome rim, pneumatic tyre with white stripe. Chrome solid,chrome rim, with solid EVA composite tyre. 14″ Chrome white air wheel, chrome rim with pneumatic tyre.(Surcharge). Chassis options: Active Grey, Active White, Classic Grey, Gold and Classic Chrome. Marlin (Black top/ White base). Thunder Cloud (White top/ Black base). Ballerina (Pink top/ white base). Shark (Black top/ Black base). Dolphin (Light grey top/ Black base). Blizzard (White top/ White base). Blaze Grey (Mid grey top/ Black base). Horizon (Black top/ City Scape on white base). Carbon Gold (Black top/ Metalled looking grey base). Frost (Light grey top/ Light grey base). Flint (Mid grey top/ Mid grey base). Classic chassis includes: Chrome air whitewall or chrome solid wheels. Optional Classic chassis wheel upgrade: £20 surcharge per set. 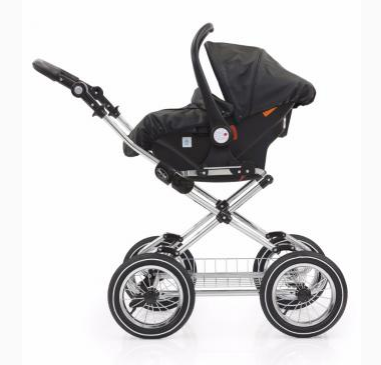 Options: 14″ Chrome white air wheel or 14″ Chrome black air wheel.